It is hard to know where to begin when describing The Bell Tower on 34th, “as seen by a Houston Wedding Photographer”. For a wedding photographer, it is like an eighty-course buffet dinner in Las Vegas, with everything from Lobster to BBQ. It is not possible to execute on every photographic opportunity in one wedding. It’s big, it’s awesome, and it’s done very, very well. It could easily take two or more days to photograph the entire venue. Perhaps the best way to describe The Bell Tower on 34th “as seen by a Houston Wedding Photographer”, is to approach it from the most common experience. That is, the experience you will likely have at your own wedding. Much like the eighty-course buffet dinner, you must attack with a plan. There will be limited time before the ceremony and thereafter to photographically execute in all the amazing spots. 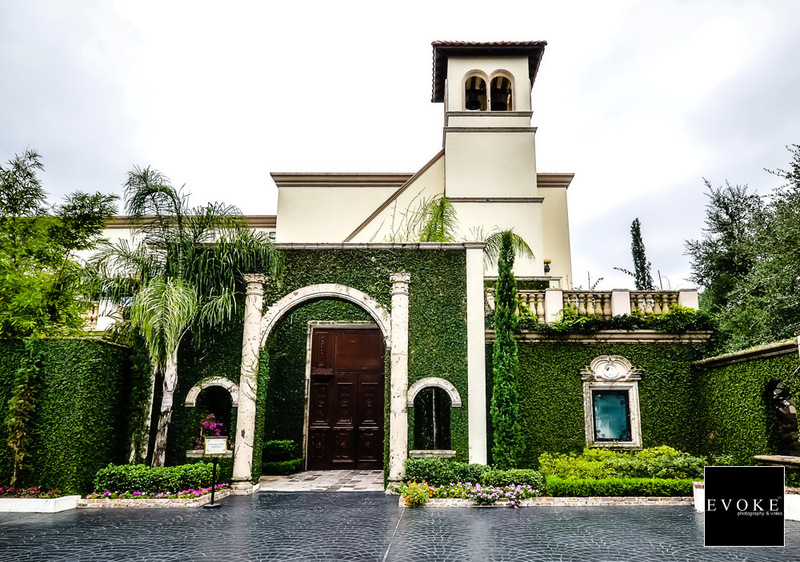 However, regardless of which room or chapel you choose, indoor or outdoor, upstairs or down, you will have access to stone walls with lush vines, overly sized wooden doors, rod iron trims, travertine columns, Italian style archways, beautiful staircases, fountain courtyards, perfect window light, outdoor shade, and decadence from every direction. Truly, any wedding photographer can capture good images here because it’s like taking a photograph in Hawaii. It’s going to look good, simply because it’s Hawaii. However, as a long time wedding photographer myself, (EVOKE has been working at the Bell Tower on 34th since the day it opened) the goal is not to be overly influenced by the grandeur of the Bell Tower on 34th. 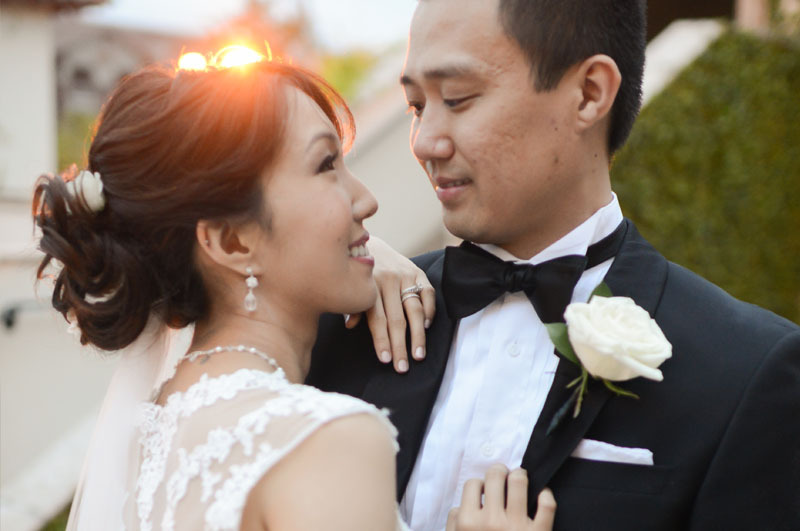 The objective of your wedding photographer should be to capture sincere emotion, love, and feelings between the two of you. The Bell Tower on 34th should simply be an amazing background in your story, and that is something it does very well. Most likely you will be having your Ceremony and Reception at the Bell Tower on 34th. Occasionally, Bride’s choose to get married at their Church and and use the Bell Tower on 34th as a reception venue only, but it’s rare, and as a wedding photographer I do not advise it. There are too many advantages to having your wedding, Ceremony and Reception, in the same location, especially at the Bell Tower on 34th. 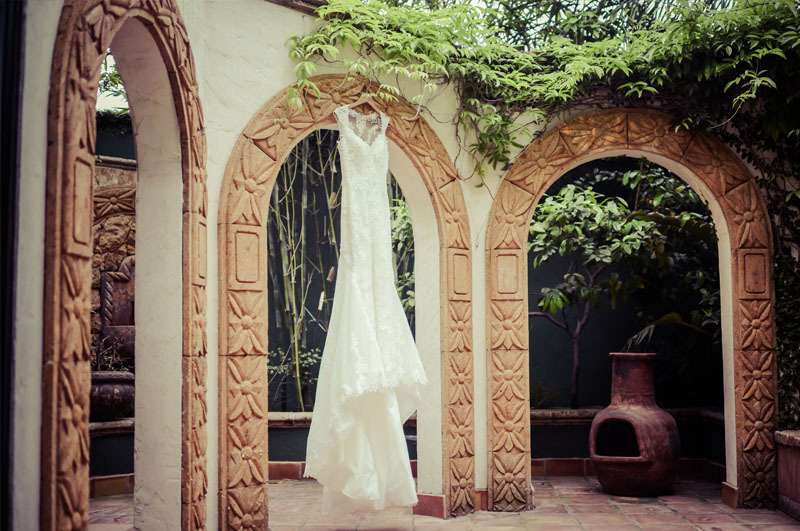 With that in mind, you will likely be getting dressed in one of the many Bridal Rooms connected to, or closely located to your Ceremony location. 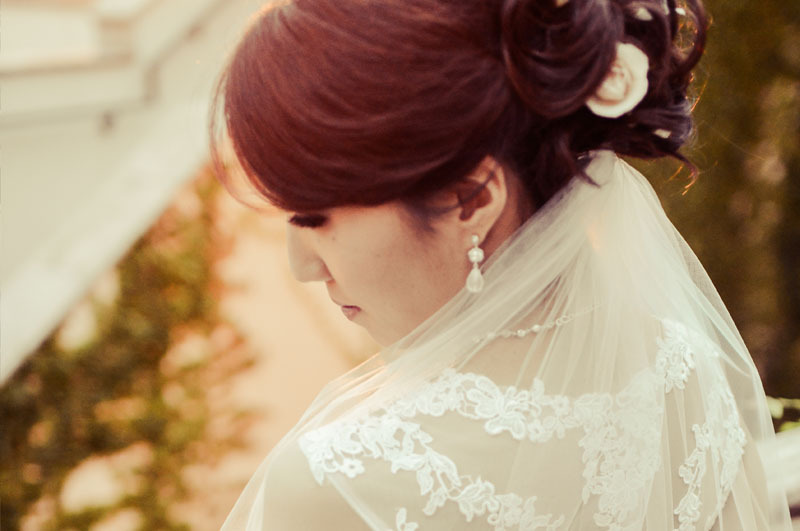 Once dressed, I suggest Bridal Portraits around one of the many oversized wooden doors. They are truly unique (I imagine extremely expensive) and resemble a door from an ancient castle, built for a giant. 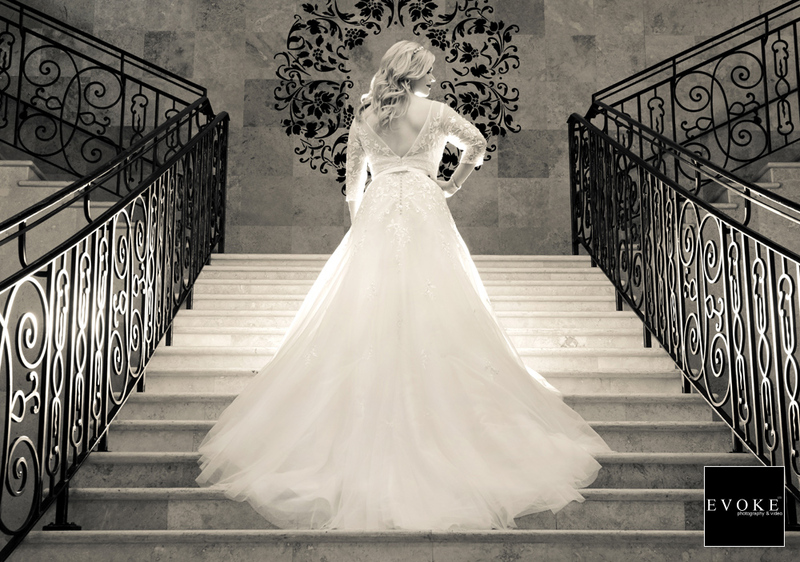 The dark grain and weathered texture contrast well against a wedding dress, and the resulting images offer good subject (Bride) to background definition, and keeps the viewer’s attention on the Bride. One of the great things about the Bell Tower on 34th (that is often understated) is the possibility to get lots of angles during the wedding ceremony. Unlike in a Church, your Wedding Photographer should be able to discreetly move around the guests to obtain different points of view during the ceremony. Most likely you would like an image as you walk down the aisle, the expression of your significant other as they see you, and different angles as you face each other. That is four possible angles, and requires lots of movement by the wedding photographer. The Bell Tower on 34th allows ample space for such movement (in most situations). Obviously, if you’re having a larger than average wedding, space may be limited. However, that is unlikely at the Bell Tower on 34th. The other advantage is that every angle is going to be stunning. After all, this is the Bell Tower. Some wedding venues have a nice altar, but the back of the chapel leaves much to be desired. The Bell Tower is amazing from every angle. Thus, every image will look amazing. The wedding reception ballrooms of the Bell Tower on 34th are equally (if not more) impressive. 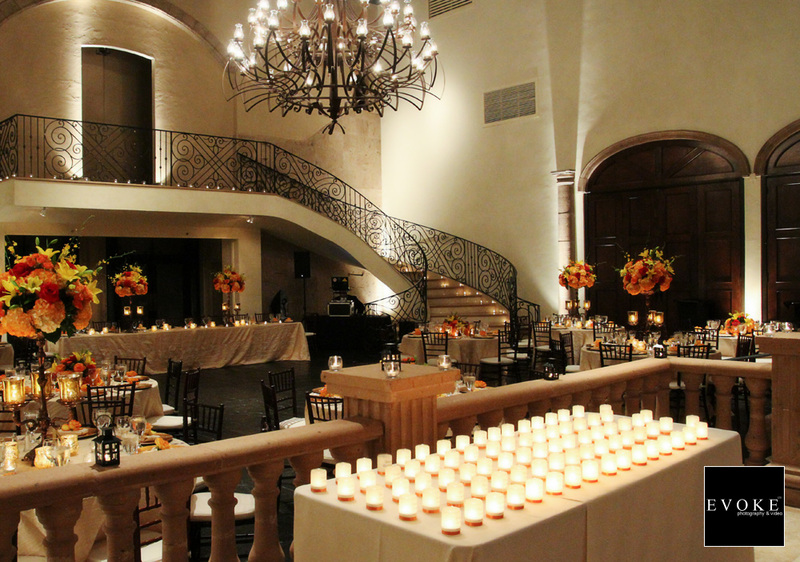 Both of the main ballrooms have high ceilings, opulent chandeliers, and stone staircases. 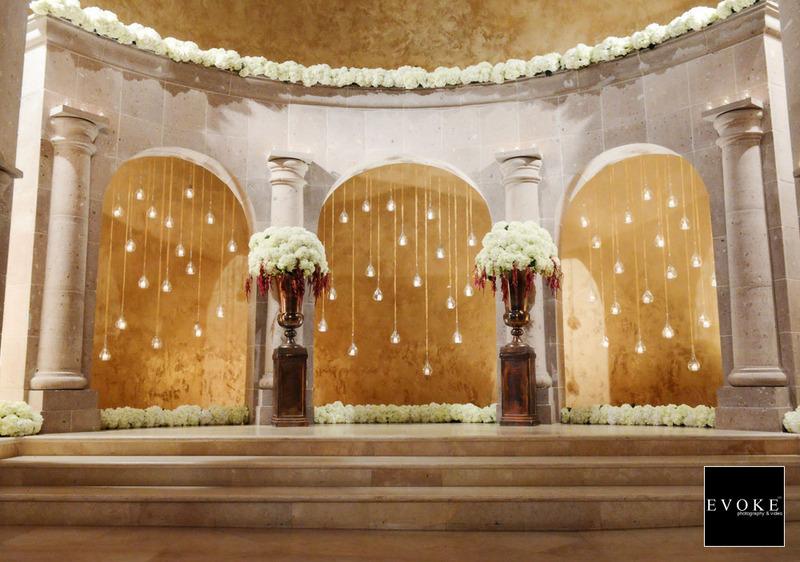 As with all large ballrooms, I highly recommend “up-lighting” around the perimeter of the walls. I’m not sure if this is standard for the Bell Tower on 34th, or a package add on. However, it’s worth the money. Uplighting in such a ballroom adds visual depth and dimension. Both of which are good for photography. From the perspective of this wedding photographer, The Bell Tower on 34th is one of Houston’s top wedding venues. If you are looking for a wedding venue that will take your breath away, Bell Tower on 34th is the place.